I don’t normally play FPS video games. They aren’t my thing, I’m more of a spell casting, sword wielding RPG kinda girl. But I decided to give Halo: Reach a fair try. And I’m seriously glad I did. First off, it’s GORGEOUS. And I have no resistance when it comes to something pretty. The graphics team outdid themselves, and it’s a fitting look for Bungie’s last hoorah. 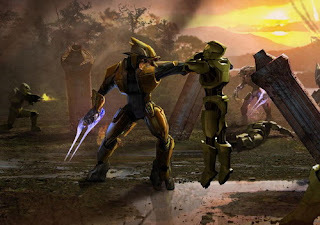 They revamped everything for this game, the design of the enemies, the way your Spartan armor looks, even the Warthogs, Mongooses and Phantoms got a visual reboot. I was also excited to find that I could actually play the whole game as a female Spartan, a great way for girls to show their pride in playing an FPS. The various and numerous armor customizations also kept me happy for hours. All the color combos and finding a good emblem was a lot of fun, for me especially, because customization is my favorite part of an RPG. Another thing that surprised me was how much I have enjoyed playing the multiplayer. Classic Slayer is my favorite mode of play though I am also quite fond of Firefight, or even Gruntpocalypse, when I’m in a bad mood. In the two weeks since I started playing I’ve managed to work my way up to Sergeant 1st class, and for someone who can barely play on Easy without dying horribly, that’s an achievement. The daily challenges also encourage me to play more and to focus on certain things, such as sniping. I was terrible but I am slowly getting the hang of headshots, especially in the campaign when I can hear a bunch of children scream, “YAY!” and see confetti every time I headshot a Grunt. The campaign also really drew me in. I became very attached to the characters, and to save those who may not have played Reach or finished it I won’t reveal the fates of anyone. But suffice to say, it was beautifully written, even if they didn’t go along with Eric Nylund’s masterpiece The Fall of Reach. In closing I would like to reiterate that I DON’T play First-Person Shooters. Ever. But this game, it has somewhat converted me. And I think I like it. This entry was posted by videogamedoc87 on September 22, 2010 at 11:54 am, and is filed under games, gaming, geek, Review, Video Games. Follow any responses to this post through RSS 2.0.Both comments and pings are currently closed. It really is a beautiful and well written and directed game. I had my doubts before its release but those are long gone. I have grown to love the DMR with each passing day. I'm also saving all my Halo Dollars for the Black Visor. I am super excited to start a legendary run with 3 friends as well. Did this for Halo 3 and it was a blast.